Veni, Vidi, Blogi: I Came, I Saw, I Blogged: How To Get Your Husband To Write A Post. I know this may come as a shock to most of you, but there are some skills that I am not naturally good at - building things being one of them. 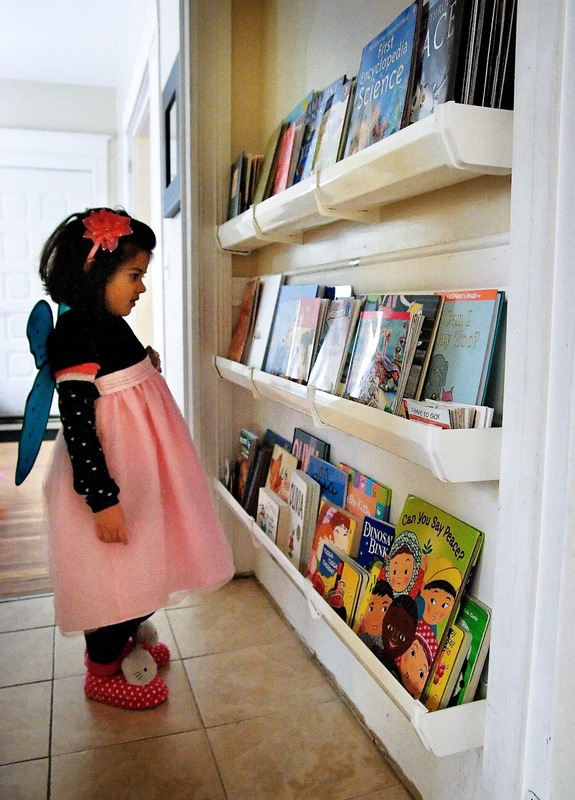 That is why I knew I was in over my head when I asked Yousuf to explain, in very simple words, how he installed the rain gutter bookshelves so many of you have asked about. - For 3 shelves that were 5 feet each, I purchased 2 rain gutters (12 feet each), 6 brackets (2 per shelf) and 6 end caps from our local big-box hardware store. - Then I cut the rain gutters to the right length. I tried it with a saw at first, but the gutters were too flexible and ended up bending instead of actually being cut. Ultimately, I had success using a Dremel Rotary Tool with the Diamond Cutting Wheel. It worked perfectly, except for all the gutter dust that flew all over me, all over the Dremel and all over the workshop. But that's why Shop Vacs were invented. - Because we have an old house with plaster and lath walls, I couldn't mount the gutter brackets with standard drywall plugs. Instead I used Wall-Dog Anchor Screws but if you don't have a 100 year old house you won't have that problem. - I drilled pilot holes for the Wall-Dogs and then mounted the gutter brackets to the wall using an impact driver. - I then stuck the gutters into the brackets. Instant shelving. - For added stability, I also anchored the endcaps of the gutters to the walls with the Wall-Dogs. Those things are now on so tight that you can use them as a climbing wall, as Nissa demonstrates daily. - For the entire project, we spent about thirty dollars, and it took me less than half an hour from start to finish to put the shelves up. Cheap, easy, and really useful - that's my kind of DIY project. Mahreen's Note: For those of you that are like me and need more detailed (and more visual) instructions, I happened to run across this great online tutorial for installing your own rain gutter bookshelves. I hope it will help to fill the gaping hole left by the non-existent purple laser level. Such a tragedy! Now go forth and build! And be sure to link to the pictures of your finished projects in the comments below, whenever you finish them. I would love to see how they all turn out! Happy building, and happy reading!